One of this year's biggest movies is just one month away, with Disney's Beauty and the Beast hitting theaters on March 17. Before this blockbuster-to-be arrives though, a hilarious mashup video has surfaced. It's essentially the Beauty and the Beast trailer featuring Emma Watson as Belle, with the iconic beast, played by Dan Stevens, nowhere to be found. Taking the Beast's place, through some inventive editing, is none other than Ralph Fiennes' Lord Voldemort from the Harry Potter franchise. This hilarious recut portrays this odd couple as a match made in heaven, and it actually meshes with the real trailer quite nicely. The video comes courtesy of YouTube channel Pistol Shrimps, which carefully drops Voldemort in place of The Beast, and the result is perfect. Before Emma Watson signed on to play the iconic Belle, she spent a decade playing Hermione Granger in the Harry Potter movies, actually fighting Voldemort and his axis of magical evil with her friends Harry Potter (Daniel Radcliffe) and Ron Weasley (Rupert Grint). The parallels between The Beast and Voldemort are quite interesting, making this mashup even better. The video is currently #15 on YouTube trending, with over 1.4 million views in the three days since it launched. The story and characters audiences know and love come to spectacular life in the live-action adaptation of Disney's animated classic Beauty and the Beast, a stunning, cinematic event celebrating one of the most beloved tales ever told. Beauty and the Beast is the fantastic journey of Belle, a bright, beautiful and independent young woman who is taken prisoner by a Beast in his castle. Despite her fears, she befriends the castle's enchanted staff and learns to look beyond the Beast's hideous exterior and realize the kind heart of the true Prince within. The film stars Emma Watson as Belle, Dan Stevens as the Beast, Luke Evans as Gaston, the handsome, but shallow villager who woos Belle, Kevin Kline as Maurice, Belle's father, Josh Gad as LeFou, Gaston's long-suffering aide-de-camp, Ewan McGregor as Lumière, the candelabra, Stanley Tucci as Maestro Cadenza, the harpsichord, Audra McDonald as Madame de Garderobe, the wardrobe, Gugu Mbatha-Raw as Plumette, the feather duster, Hattie Morahan as the enchantress and Nathan Mack as Chip, the teacup. The cast is rounded out by Ian McKellen as Cogsworth, the mantel clock and Emma Thompson as the teapot, Mrs. Potts. Oscar-winning director Bill Condon brings this adaptation of the 1991 animated musical to live for a new generation. Mandeville Films' David Hoberman and Todd Lieberman produce the movie with eight-time Oscar-winning composer Alan Menken, who won two Academy Awards (Best Original Score and Best Song) for the first Disney Beauty and the Beast. He provided the newly updated score, original songs written by Menken and Howard Ashman, as well as several new songs written by Menken and three-time Oscar winner Tim Rice. Beauty and the Beast is coming to theaters on March 17, 2017. 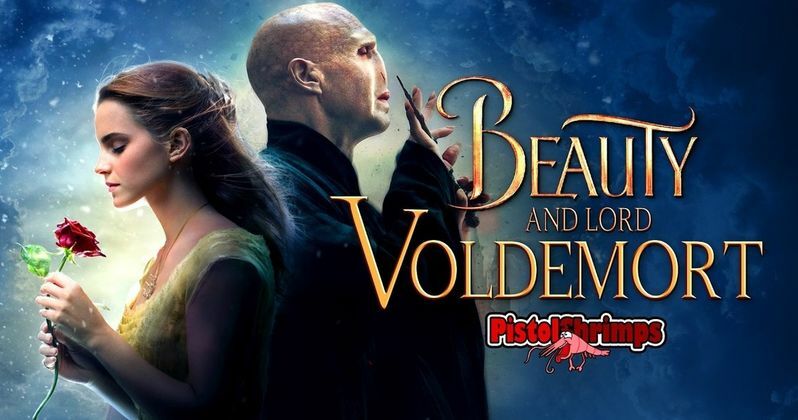 Take a look at this hilarious mashup for Beauty and the Beast with Lord Voldemort.